In a small mixing bowl, whisk together flour, baking powder and salt; set aside. Combine butter and sugars in a large mixing bowl; beat with an electric mixer until creamy. Add egg, sour cream, lemon juice and grated lemon peel; beat for an additional three minutes. Stir in the flour mixture until well blended. Drop by teaspoonfuls, two inches apart, on ungreased baking sheets. (Line pans with parchment paper for easy cleanup.) Bake at 375°F 12 to 14 minutes, or until cookies are set and edges are light brown. Cool slightly before removing to racks to cool completely. Meanwhile, prepare filling. 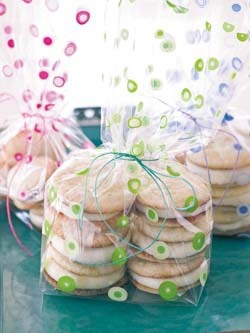 Spread 2 tablespoons Lemon Cream Filling on the bottom side of one cookie. Sandwich the filling with another cookie. Makes about 18 cookie sandwiches.